A Southern Grace: resolved to evolve? Nah, not really. I'm not a person who usually makes New Year's resolutions (except for that one time when I resolved to make a resolution--WIN! ), but I'd like to share an impromptu decision I made around the first of the year. I'll now be striving to appreciate a cake for more than just the frosting that bedecks it, a noble goal for this sugar-loving girl, to be sure. So, you ask, what caused the sudden change of heart? A very special cake indeed. Laden with pecans and pineapple (and interestingly, no fatty fats of which to speak), the texture and degree of moistness in this treat make frosting completely unnecessary. Yeah, I said it. If you don't think you can match my feat of strength here (she says sarcastically, knowing that the next dessert she made was a batch of brownies coated with butterscotch goo), a fitting frosting would be cream cheese. Mmm...cream cheese frosting. This may be harder than I thought. Preheat oven to 350°F and grease a 13x9-inch pan or 2 9-inch round pans. In a large bowl, combine the sugar, flour, baking soda, cinnamon, and pecans. Combine eggs, vanilla, and pineapple; stir into dry ingredients just until moistened. Pour into prepared pan(s) and bake for until a toothpick inserted near the center comes out clean--32-38 minutes for a 13x9-incher or 24-30 minutes for the rounds. Cool completely on a wire rack. Yes, a cake does not a frosting make. Happy New Year and many more great recipes this year! That cake looks devilishly scrumptious! Que textura tan fantastica, esto se ve realmente delicioso. I'm a big frosting lover as well. So for me to fall in love with an unfrosted cake...it takes a lot. This does look delicious though! Oooh! This cake looks amazingly super moist! Frosting is my favorite part to a cake also, but this looks perfect as is. It's so moist. I'm saving this in my recipes! This cake does sound VERY scrumptious and I love pineapple, hence...the book marking! 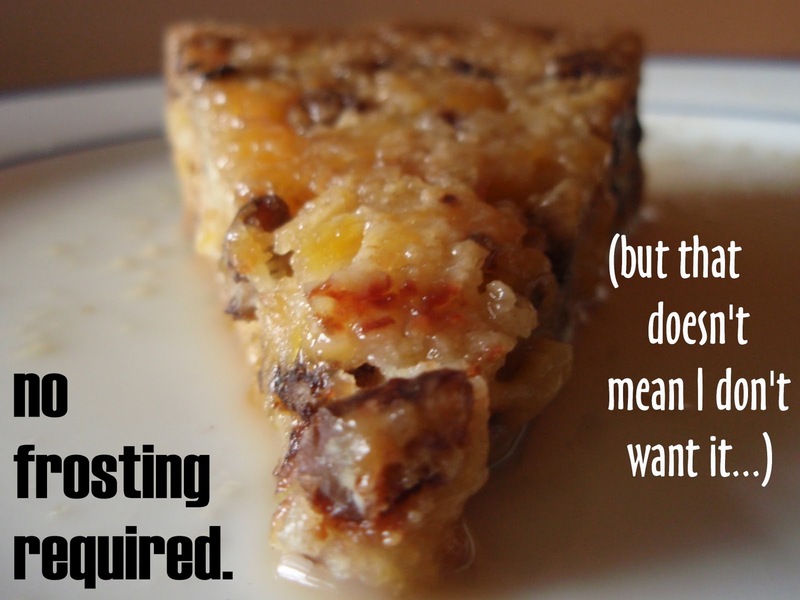 A moist cake without buckets-o-butter? You are a genius! that cake doesn't look like it's suffering from lack of frosting. It looks moist and delicious! This reminds me of a pineapple cake my Mom used to make a lot. (It had cream cheese frosting.) Yours looks fantastic and definitely not in need of any further embellishment! After I read your recipe Grace, I realized that I make this cake quite often, only I'm guilty of adding the cream cheese frosting....but this moist, gooey cake could stand alone as the pineapple adds so much flavor. It just gets better everyday! I make something very similar and I do use cream cheese frosting.. :)GMTA!! Oh wow does this look enticing! And you're right, Grace, I think I could forgo the frosting on this little beauty! Happy New Year! Happy to see you're back to posting! I'm surprised to see such a moist-looking cake has no fats, besides for the eggs. Looks so good, and just packed with pecans. Pineapple, pecans, cinnamon....nothing else is needed here! Love this. Pineapple is in season, isn't it? Or maybe not... I had some at my parents' the other day and it was soooo good. You had me at "party cake." Who need frosting when the cake looks as delicious as this? I'd have to load on icing. I'm a sucker for cream cheese frosting. Excuse me while I wipe the drool off of my chin. YUM! Cream cheese frosting just might be overkill. Maybe. This looks gooey and sweet. Perfect!! Yum! 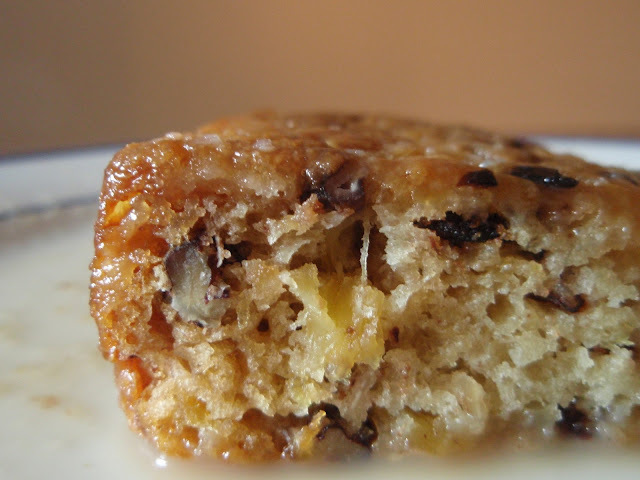 pecan and pineapple sounds like an amazing combination, what a delicious cake! wow! This looks so ooooey-goooey. LOVE THAT. It sure does look like it can stand alone. I need to have some of that! That looks like quite a cake! The sugary blanket of icing is somewhat like a security blanket to me, it is difficult to let go of. My husband hates frosting, so he'd love this one for sure!! It looks awesome. Thanks for sharing!!! Ha! Love it. "Sugar blanket not required" You are the best! I love frosting, but wow this cake looks killa!! I like the resolution - I prefer this type of cake anyday and would gladly accept an invite for afternoon tea. Happy New Year and here's to good cooking in 2011. Hubby is insistent that all cakes must have frosting. I delight in a cake like this without! Don't get me started on frosting, I'm always making more than I need because you know the frosting to cake ration has to be just so. ;) But, if there ever was a cake that might not need frosting, this one is it! Looks just fantastic, Grace! Happy New Year! I'm a fan of frostingless cake myself, although my husband says it's not a cake if there is no frosting. But this looks lovely, and full of yummy fruitiness. Yum! And the name - party cake- is excellent. I made a banana snack cake two nights which did not call for frosting just a sprinkling of powdered sugar and you would have thought I asked my kids to eat dirt! They, lovers of all things banana, said the cake was "okay". Brats. Your cake does look super moist and definitely like it doesn't need frosting. "No frosting required". That there is some mighty big words. Mmm, pecan and pineapples. You're right -- you don't need anything more with this moist and luscious cake. The combination of pineapple and pecan says it all. This looks absolutely heavenly! Resolutions..no way< I never do it so why bother with it. This cake looks amazing and I could eat at least half of it by myself. Grace - I'm wearing it away!! New Year's resolutions are just a set up for failure. As soon as you tell yourself you have to do something, your mind becomes rebellious, so I avoid it altogether and don't even try to make one. But I will make this cake! Grace, you are the queen of sticky, gooey desserts. Frosting might be optional with this one - looks great. awesome texture in this cake! happy new year. This looks so delicious and yummy. And easy to make, to boot. Thank you. No New Year's resolutions here either! The cake is stunning...Oh my! I don't need resolutions, I need cake and this one will do just fine, of course I'll have mine with the sugar blanket! A cake without fat? This is a revelation! And resolving to make a resolution? LOVE IT! Happy New Year! That pineapple makes it so moist, even without butter. No frosting needed here-Yum! This cake looks delicious - all gooey and moist! Yummy. This going onto my 'make list'. I sweat, I don't think I'd know how to act it I wasn't the LAST one responding to your creations. It would just be weird ;). I knew that was a pineapple something before I flipped the page! Just made my mother pineapple upside down cheesecakes for her birthday, so I've had pineapple on the brain -- like frosting! The picture alone makes my mouth absolutely water! I have to remember this.. I'M GOING COMPLETELY NUT FOR THAT OUTRAGEOUSLY DELICIOUS CAKE !! DON'T CARE ABOUT FROSTING OR NOT FROSTING, I WANT IT NOW !!! I'm totally out of powdered sugar...so a cake that doesn't require frosting..RIGHT up my alley!! !